This program seems to address most of the major criticisms of USDA’s National Organic Program. I will be interested to see whether farmers sign on for it. It’s been a busy couple of weeks on the organic front. To put the events in context:Organics cost more. Consumers spend about $30 billion on organics each year, and the numbers are rising. Industrial food companies are cashing in on the market by buying up organic companies. Big Organics want the rules to be as lenient as possible to all them to follow the letter of the organic standards without having to adhere to their spirit. Organic production, which uses only approved pesticides and fertilizers, is an explicit critique of industrial food production methods. I think this photo comes from Jerry Hagstrom who must have seen it on the day of the annual Easter egg roll. Our review of the top 50 organic food marketers….reveals that anti-GMO and anti-pesticide advo­cacy groups promoting organic alternatives have combined annual budgets exceeding $2.5 billion annually and that organic industry funders are found among the major donors to these groups…These findings suggest a widespread organic and natural products industry pat­tern of research-informed and intentionally-deceptive marketing and advocacy related practices that have generated hundreds of billions in revenues. Finally, the findings strongly suggest that this multi-decade public disinformation campaign has been conducted with the implied use and approval of the U.S. government endorsed USDA Organic Seal in direct contradiction to U.S. government stated policy for use of said seal….As a result, the American taxpayer funded national organic pro­gram is playing an ongoing role in misleading consumers into spending billions of dollars in organic purchasing decisions based on false and misleading health, safety and quality claims. Michele Simon points out that the report is the work of the two founders of the publication, which is supported by an impressive list of food and biotechnology industry supporters. The authors make no statement about conflicts-of-interest. 84% buy organic food and 45% but them at least once a month. 81% think organic means no toxic pesticides (there are exemptions for some for up to five years). 91% think organic produce should not use pesticides. 61% think no antibiotics are used (there’s an exemption for streptomycin on apples and pears). 86% think antibiotics should not be used. 92% want a federal organic standard for fish. 84% think the use of artificial ingredients in organic products should be discontinued, if not reviewed, after 5 years. The National Organic Standards Board (NOSB) is meeting in San Antonio this week. Advocates for maintaining the highest possible standards for organic production are worried about the NOSB’s notice last September to eliminate the rule that synthetic materials approved for the organic production be reviewed every five years (see Federal Register). Advocates for Small Organics worry that the NOSB’s actions will damage the credibility of the USDA organic seal. Some members of Congress agree. the Organic Consumers Association (OCA) and March Against Monsanto San Antonio (MAMSA) staged protested the sunset of the 5-year rule at the meeting. When the bureaucrats running the USDA National Organic Program (NOP) call in the police to remove the political director of the Organic Consumers Association for protesting an illegal policy change, and continue to ignore the expressed concerns, and block her from attending the public meeting today, it’s clear that we need a new balance of power between the organic community and the organic industry. This is the price of success for organics. Everyone wants to cash in. Addition: Ellen Fried reminds me of this terrific graphic of who owns what in organics. I don’t ordinarily reprint or comment on discussions of my work but Perishable Pundit Jim Prevor’s response to my recent post on organics is worth a read. I reprint his piece with his permission. Skip the flattering comments about my work and scroll right down to his discussion of the downside of the organic community’s deal with the USDA. Our piece, Organics, Crop Yields And Feeding The World, brought many letters and public comments, including an article from one of the most prominent food analysts writing today. 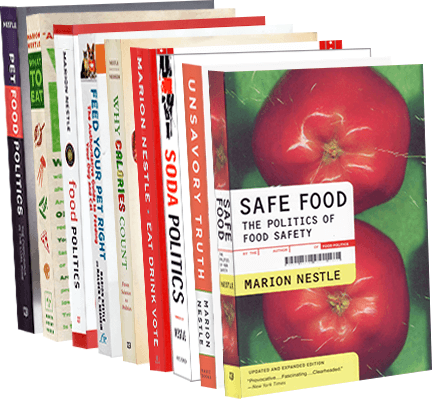 Marion Nestle, the Paulette Goddard Professor in the Department of Nutrition, Food Studies and Public Health at New York University and the author of many food and food policy related books, is often perceived by many in the trade as an enemy of the food industry. We find her enormously thoughtful and willing to ask many questions that are sometimes uncomfortable for the trade to address. We don’t always come down on the same side as her, but we always find reading her to be a wise investment of our time. What impresses me about research on organic productivity is that its interpretation can be predicted by who is doing the interpreting. I’ve seen, and review in my book,What to Eat,plenty of research demonstrating that organics are only slightly less productive than industrial agriculture and at much lower cost to soil and the environment. We think this is where most people will end up. The problem is that it is relatively easy to do research that will show organic production to be competitive. This is because as long as organic has only a tiny share of production, producers have the option to grow organic in a location that is optimized for organic production. The yields in these optimized locations can sometimes be competitive with those of conventional production. This has, though, almost no relationship to the question of whether if all production was converted to organic, would the yields be competitive. Here at the Pundit, we are in touch with too many growers who have tried to grow organic to have many doubts. Most of these growers were very motivated, they tried to grow organic because they thought they could make money doing so. Yet the results are in… demand or not, East Coast organic apples will remain a rarity. This issue is not a trivial one. Professor Nestle highlights that organic growing operates at “much lower cost to soil and the environment.” This is controversial. Organic growing utilizes all kinds of substances, and it is not easy to establish that utilizing, say, copper, is more beneficial for than environment than synthetic substances. Even if true, however, the environmental benefit would depend crucially on the ability to use the same area of land to raise food. If we were compelled to, say, destroy the rain forest to increase acreage for food production, it would be very difficult to make the case that the net benefit of organic production was beneficial to the environment. The USDA has long been an uncomfortable host forThe National Organic Program. This agency’s job is to support industrial agriculture, and organics are indeed small in comparison. But organic production is anexplicitcritique of industrial agricultural systems. Organics get higher prices. And their sales are increasing. No wonder USDA and representatives of industrial systems don’t like organics much and do everything they can to find fault with it. USDA ought to be doing all it can to work with organic producers to fix these problems. To its credit, USDA recruited undersecretary Kathleen Merrigan to try. We think most at USDA would dispute her characterization of the agency, saying instead that its responsibility is to promote US agriculture, and since 99% of that agriculture is not organic, it should mostly promote the agriculture we actually have, rather than the agriculture organic advocates might wish we had. Although Professor Nestle sees a problem in USDA hosting the program, we would say the organic community made a deal they will find difficult to live with in asking the government — any agency of the government — to manage this effort. Obviously, organic advocates could have gone out and registered a trademark and could have kept organic standards pure and enforcement rigorous. The minute the government is involved, though, politics is involved. And in politics, the organic community faces a difficult state of affairs. As long as organic is a tiny and insignificant industry, it could probably make its own rules without much interference. After all, who would care enough to fight? Yet as organic grows, it becomes a more significant business opportunity and then General Mills, Kraft, etc., become more interested. As they become more interested, they also will look to see that the rules established meet their needs. Now, obviously, there is no upside for them in tarnishing the organic “brand” — after all they want to profit from the brand. Still, over time, if organic becomes a substantial part of the food business, since organic growers are not the most powerful political force in the food industry, we will see the standards and enforcement change in a way that will benefit larger, more politically powerful companies. This is not a function of USDA misbehaving. It is a function of tying one’s hopes to political forces. Of course, we don’t have to lecture to Professor Nestle on that subject… she is the author of Food Politics: How the Food Industry Influences Nutrition and Health. According to the Organic Trade Association, organic sales totaled nearly $27 billion in 2010, and constituted 11% of produce sales. Is this “tiny and insignificant”? I don’t think so. Is the National Organic Program really a pact with the devil? Organic producers worked long and hard—fully 12 years—to get organic standards codified in 2002. Was this a mistake? On March 02, USDA announced that it was revoking its accreditation of two certifying agencies, Certified Organic, Inc. (COI) and Guaranteed Organic Certification Agency (GOCA). GOCA’s problems had to do with “persistent noncompliance,” including such things as “failure to require clients to use defined boundaries and border zones as required by the organic standards.” This mayall sound absurdly bureaucratic but it means the certifiers could be overlooking producers’ violations of organic standards. You can track down the records of such things on the USDA’s website, and see the handful of other such enforcement actions at the National Organic Program’s site. I’d say this is progress. Organic producers are supposed to follow the rules of the National Organic Program, and to be inspected to make sure they do. If the inspectors aren’t doing their job diligently, you won’t be able to tell whether the organic foods you buy are worth the premium prices. People will pay more for organics if they think the producer is credible. Organics are about credibility. That is why the USDA needs to fiercely enforce organic certification. Doing so protects the industry. The more of this sort of thing, the better. In a move that should bring cheer to anyone who cares about the integrity of organic certification, the USDA has banned the Organic Crop Improvement Association (OCIA) from certifying foods from China as organic. According to the accounts in today’s New York Times and the USDA’s enforcement announcement, OCIA used employees of a Chinese government agency to inspect state-controlled farms and food processing facilities. Oops. This is sending the fox out to guard the chickens (organic, hopefully). The Chinese government has a vested interest in selling certified organic foods and can only be expected to be lenient in enforcing rules for organic production. Honest, reliable, consistent inspection is the cornerstone of consumer trust in organics. If producers aren’t following the rules to the letter (and, we wish, the spirit), why would anyone be willing to pay higher prices for organics? Since it’s impossible to prove that organics are more nutritious than conventional foods, the entire system rests on trust. And the value of trust rests with the inspectors. The department objected to the arrangement after a 2007 audit, saying the partnership violated a rule barring certifiers from reviewing operations in which they held a commercial interest. The department moved to revoke the association’s accreditation and the group filed an appeal. The department’s disciplinary process is conducted in secret, and negotiations often drag on. In O.C.I.A.’s case, it took nearly three years to resolve. This cozy arrangement has been going on for at least the last three years? It’s good that USDA is taking this on now. But USDA really needs to take a hard look at conflicts of interest in organic certification, domestic as well as foreign. Some USDA-authorized certifying agencies are much more lenient than others. Witness: certification of fish and pet food as organic, despite the lack of final rules for such certification. Some certifying agencies manage to find ways to do this; others refuse. The organic industry ought to be pushing USDA as hard as it can to establish and enforce the highest possible standards for organic certification. I’m looking forward to reading what the Organic Trade Association—and OCIA—have to say about all this. This week, EatingLiberally.org wants to know whether I think organics are honest. Do organic food producers really follow the USDA’s Organic Standards? I think most do, but the question comes out of an incident in California where a fertilizer seller was passing off an unapproved chemical fertilizer as organic. Apparently, state agriculture officials knew about this but didn’t bother to tell anyone or do much about it. Not a good situation. Here’s my response to all this.